Archbishop Lefebvre Recognized that Gallicanism is Not Possible. The question of the status of the pope MUST be answered. 42 years and We Still Cannot Recognize this? Ultimately, the question of the status of the pope must be answered. Archbishop Lefebvre at this time (1976) simply could not make up his mind as to the status of the Destroyer Paul the Sick. The important part is the he was PUZZLING OVER THE QUESTION. He clearly states though that the pope cannot teach error, because he is guided and protected by the Holy Ghost. It is hard to get around the Archbishop's words, when we hear him speaking in his own voice in his own native language. 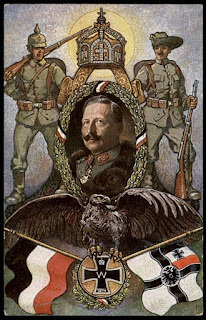 I cannot imagine him being ANYTHING OTHER THAN a RAD TRAD THOMIST today! Logical Bear Trap? Canadian Scholar Publishes Thesis Which Declares Francis to be a Public Heretic and Having Lost Office, based on Filial Correction and Canon Law. My name is Jason A. Brown. I am a medieval historian and translator of old Latin books. I am currently a PhD candidate in the final year of my doctorate. I have a Master of Arts in Medieval Studies and a Bachelor of Arts (Honours) in History. I have been a Catholic for 9 years, and for most of that time I have been studying Catholic doctrine, scholastic thought, and Church history, particularly the Church in the middle ages and in the 19th and 20th centuries. Byzantine Catholic Patriarchate Excommunicates Francis for Heresy; forbids Priests and Bishops to Mention him in the Divine Liturgy. Francis Bergoglio, a Jesuit, has been admonished, warned several times to distance himself from heresies. However, he obstinately rejects any repentance. He continues to cause extreme offense not only to the believers of the Roman Catholic Church but also to all Christians and unbelievers. Bishop Fellay gives an Assessment of the SSPX in his last months as Superior General. Are All the Deceivers Going to be Sainted? Prove them Wrong. 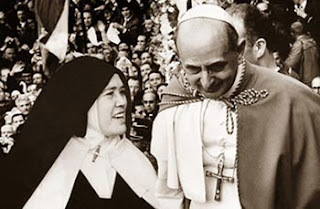 If there was not a more perfect way of proving that the line from John XXIII through Paul VI to John Paul II WERE NOT SAINTS is to show that they perpetrated one of the most diabolical frauds in the history of the Catholic Church --- put forward to the world a fake sister lucy. IF an investigation proves this to be the case, then the fate of the real sister lucy and the use of the fraud to publicly endorse everything that newly "canonized" NewChurch has done over the course of the last 60 years wll testify against the holiness of these men --- in fact, it will scientifically prove the contrary. I know that I am saying a lot here, such is my intent. The Post-1958 Sister Lucy and NewChurch are One. If She was authentic then Most Everything Relating to Fatima had to do with the "John Paul II the Great". If this is an Imposter, then we are speaking about a diabolical deception of the Highest Order. 1) Russia HAS BEEN CONSECRATED by JOHN PAUL II. 2) RUSSIA HAS ALREADY CONVERTED, but "Conversion" has NOTHING TO DO WITH CONVERTING TO THE CATHOLIC FAITH. Just as John Paul II would say since he is the one who approved the Balamand Declaration in which it was said that the Catholic Church no longer sought the conversion of the Eastern Orthodox. 3) The Third Secret is about an unsuccessful assassination of John Paul II, which, for some reason, would be better understood in 1960 even though it would take place in 1981. 4) The New Mass is Fine. Sister Lucy, the Seer of Our Lady, went to it with great joy. After reading an early edition of Fr. 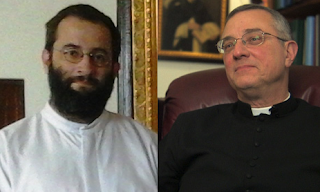 Chazal's updated attack on Sedevacantism and the writings of Fr. Anthony Cekada, I formulated 6 questions that came to mind when reading over the new text. My questions to him are immediately below and his response is below that. Of course, I am not a trained theologian....heck, I don't even have my accounting degree! The board is set...the pieces are moving..............I would like to hear comments on this from ALL sides. Submissions welcome! 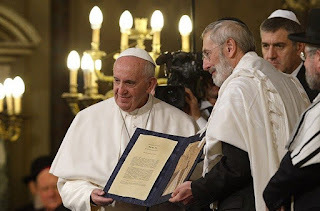 Vatican Document Affirms that not only do the Jews share our Religion, but the Torah is the Word of God just as Jesus Christ is the Word of God. 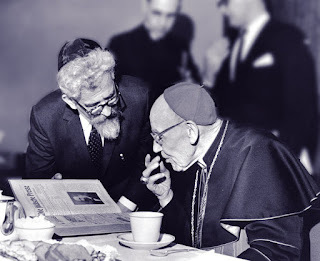 Was this the final documentation of the Apostasy set up in 1958 to play itself out now? If so, why be so mad at Francis?